“Pückler-Muskau” by Auguste Hüssener – Stahlstich, in: Deutsches Taschenbuch auf das Jahr 1837. Hg. von Karl Büchner. Berlin: Duncker u. Humblot 1837. Licensed under Public Domain via Commons. Tomorrow, on October 31, is Halloween, but do you know what is today? 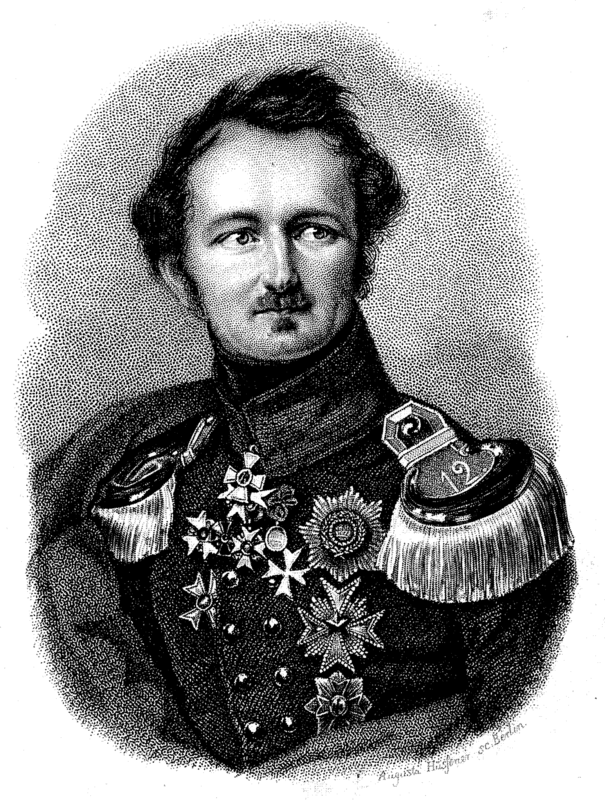 The 230th birthday of Prince Pückler-Muskau. Prince who? Don’t worry, I wouldn’t know him either if I weren’t currently doing research on the history of Egyptology. Hermann Ludwig Heinrich von Pückler-Muskau (1785–1871), born in Eastern Saxony, was a German nobleman who today would be considered a member of the “jet set.” In German, a three-layer ice-cream creation is named after him. In English, though, it’s called Neapolitan ice-cream – and Pückler-Muskau doesn’t deserve the honor anyway because he by no means invented that treat. Instead, he spent his time designing landscape gardens, writing, and traveling. On account of the latter, I found part of his legacy when I visited Luxor earlier this month, the place in Upper Egypt that houses so many of ancient Egypt’s most magnificent remains, from the tombs of the Valley of the Kings to the Pharaonic temples along the Nile. Signature from dead German prince in Egypt. Photo by Maximilian Georg. 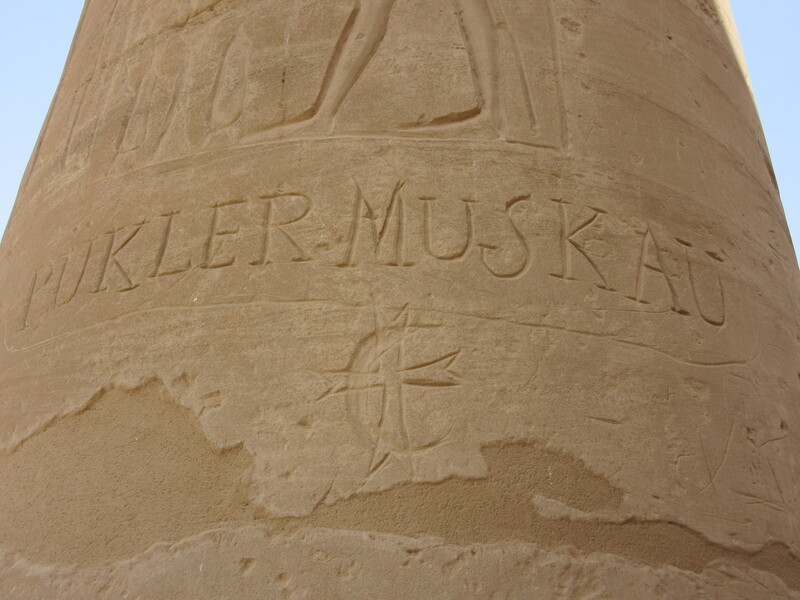 Compared to the ancient Egyptian inscriptions, Pückler-Muskau’s suffers from the obvious flaw that the “c” is missing in front of the “kler”, which may indicate that he didn’t chisel himself – or he did but lacked concentration in Upper Egypt’s sweltering heat. I’ve in any case wondered how that chiseling took place in practice. In each case, the carving seems deep enough to let the letters, unless somebody intervenes, accompany the monuments well through the next three millennia of their existence. To those who carried the signatures out we must say: good job! But however outraged we may now be by how in the past illustrious persons treated cultural heritage, we need to make one concession to Pückler-Muskau: If he hadn’t insisted on his name being chiseled in a column of the Ramesseum, The Leipzig Glocal would most likely not in the least have commemorated the 230th birthday of that Saxon adventurer… and this would have been a real shame, wouldn’t it? Maximilian Georg is a historian based at the University of Leipzig, currently researching in Egypt.